Slowed Saudi Education Spending Felt in U.S. The kingdom appears to be cutting back on its scholarship program due to the collapse in the price of oil. Washington, D.C.—The collapse in the price of oil is beginning to affect education spending in the oil-producing countries of the Gulf, and those changes are sometimes reflected on distant shores. 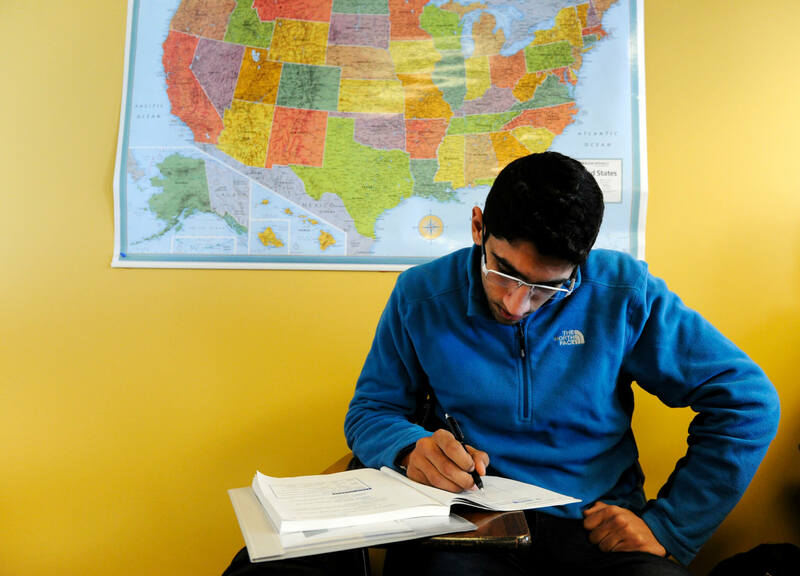 Many intensive English-language programs in the United States report that they have begun to see substantial decreases in enrollments from Saudi Arabia. This is being viewed as a harbinger of the long-term educational effects of severely depressed oil prices. The kingdom appears to be cutting back on its scholarship program that has allowed tens of thousands of young Saudis to earn degrees at Western universities over the last decade. The King Abdullah Scholarship Program, KASP, established in 2005, pays full tuition and living expenses for students in colleges and universities in many industrialized countries. A large majority are in the United States. The expensive program has grown rapidly; by the middle of last year it was supporting 96,000 undergraduate and graduate students at hundreds of institutions across America, according to Saudi education officials in the U.S. In addition, it was supporting 25,000 spouses and children of scholarship students. Most students start with a year or two of intensive English lessons. It is these language programs that are feeling the first effects of the spending cuts. Most of the 451 member programs of the American Association of Intensive English Programs appear to have suffered significant declines in Saudi enrollments in the last month or two, according to Cheryl Delk-Le Good, the group’s executive-director. Of 92 members that answered questions sent out by Delk-Le Good, in response to Al-Fanar Media’s inquiry, 78 percent reported reduced enrollments of Saudi students compared to levels at the end of last year. “Some programs reported they may need to lay off some adjunct faculty,” said Delk-Le Good. She added, “Some of our programs will end the lower-level foundation programs they had established in the last few years” to accommodate the portion of the young Saudis who had so little English that they could not handle normal beginner-level instruction. In addition, she says, some programs are likely to end the less academically oriented English classes they were offering for the dependents of Saudi students. The Saudi and international press have reported that a high-level council chaired by Saudi Deputy Crown Prince Mohammed bin Salman that is looking at ways to rein in state spending called for reductions to the budget of the massive scholarship program. Official details have been hard to come by, and the Saudi Arabian Cultural Mission, SACM, which supervises the scholarship students in the United States, declined requests from Al-Fanar Media for clarification. The Saudi authorities seem to be tightening the rules for awarding scholarships. Previously the program had rather liberal criteria, for example accepting students interested in almost any field of study. Students who were not granted a scholarship while still in the kingdom could often get into it by paying for their own enrollment in an American institution and then later applying to enter the Saudi program. But starting last year, authorities began refocusing the program to support specific labor needs, especially in the public sector. Under the slogan, “Your Career, Your Scholarship,” the program is now favoring candidates who are employed by—or have a job offer from—a government agency. Moreover, instead of the hundreds of colleges and universities across the United States that currently enroll Saudi scholarship students, the program will now focus on students who can gain acceptance at the top 100 American institutions. (It remains unclear, however, which list of the top 100 would be used). Scholarship students in their pre-academic English training may now be required to show a certain level of competence at the end of their first year in order to receive further support. In the past, scholarship students who graduated from an undergraduate program could fairly easily win state support for a graduate program. That will supposedly no longer be possible, and students will be required to return home at the end of their initial studies apply from the kingdom for any further studies. Finally, students who enroll on their own at an American institution must now supposedly pay for their own English-language study and then earn 30 undergraduate credits (or 9 graduate credits) before being eligible for a scholarship. A decrease in scholarship students does not yet appear to have been felt in academic programs in the United States. But a number of institutions have built up their foreign enrollments with Saudi students in recent years and are waiting anxiously to see how they may be affected. The most popular majors for the Saudis at Tennessee State are engineering, business administration, health information management, and graduate education, a typical selection for Saudis at other institutions as well. Other institutions report that they have asked SACM, which employs several hundred student counselors and others at a recently built headquarters outside Washington DC, but have received no news about how they may be affected by the changes. The scholarship program was started in 2005 through an agreement between Saudi King Abdullah bin Abdulaziz, who died in January 2014, and then-U.S.-president George W. Bush. The program was intended to bring the United States and Saudi Arabia closer together and to help repair damage done to the kingdom’s image by the revelation that the majority of the 9/11 hijackers were Saudis. The expensive program’s other key aim is to support the rapid modernization of Saudi Arabia by creating a large cadre of U.S.-trained professionals who could help run new schools, hospitals, administrations and businesses, as well as bringing new ideas to the deeply conservative but oil-rich kingdom. In another sign of cutbacks in the kingdom’s educational spending, the annual International Exhibition & Conference on Higher Education that has been held in Riyadh was cancelled this year. More than 400 institutions from around the world typically attended the meeting to recruit Saudi students, and a one-day academic conference was held alongside the recruiting exhibition, with many participants flown in on business class at Saudi expense. But now it seems the flow of students leaving the kingdom and the educators going to it will be slowing, at least in the immediate future.